“Hamar Laser’s new A-516 Target is a 2-axis, self-centering target with roller-bearing feet, designed for deep-bore, large-diameter bore straightness applications, such as gun barrels and hydraulic cylinders. It can measure bores as small as 3.25” (82.6 mm) and as large as 16” (406.4 mm) for straightness and alignment. 20x20 mm PSD, (position sensing device) with 0.001 mm resolution and < 1% linearity. Built-in, self-centering adapter that uses measuring legs with roller bearing tips for easy insertion into very deep bores. Can perform straightness checks on gun barrels or cylinders up to 33 feet (10 meters) long. For bores from 3.25" (82.6 mm) to 16.00" (406.4 mm). 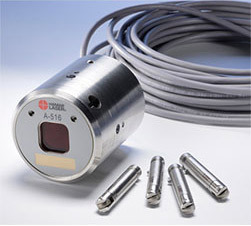 Quick-connect poles with measuring scale have anaccuracy to ± 5 mm. Accelerometer helps to keep the target in the same rotational orientation for better accuracy. Supports our R-1307BC+R 2-Axis Readout. Use with Bore9 Software to record alignment data, calculate the straightness and plot the alignment data points. Straightness checks on gun barrels and cylinders. Range 3.25 " (82.6 mm) to 16.00" (406.4 mm). Each bore requires 1 set of A-516CLR measuring legs.